The Ferrari 360 marked a new era for Ferrari with new Pininfarina body styling and an all aluminum chassis. It was also produced in significant numbers, with 8,800 Modenas (coupes) and 7,565 Spiders (convertibles) made during it’s production run from 1999 to 2005. The new 3.6 liter engine that generated 400 hp and propelled the 360 from 0 to 60 in 4.3 seconds, was used across the Ferrari 360 lineup. Now that the earliest models are over 15 years old, maintenance is key to keeping the 360 running as it should. Many Ferrari techs praise the 360 for it’s build quality and reliability, but that does not mean that it is free of potential issues. There are a few serious things to look out for, that many at this point should have already been fixed. So let’s look at some common Ferrari 360 maintenance items and what they might cost you. The variator that controls the variable exhaust timing, sits directly on the end of the exhaust cam. If it goes, it can cause a lot of damage to your 360’s motor. There was a factory recall by Ferrari to address the problem and should have already been done. You can call a Ferrari dealer with a VIN number to verify the work. If your car’s VIN number is above 123399, then it left the factory with the newer parts. The variator costs about $400 and a new tensioner around $750, the parts are not to bad, but the roughly $3,000 in labor is what can hit you hardest. Like it says, this bracket can crack and if left without repair can result in more costly repairs down the road. A new bracket was used in 2000 and up models to solve the problems, but if you have a 1999, it’s easier and much cheaper to just weld and reinforce your current bracket. All Ferrari 360s except the very late models have a relay that is underrated for the F1 system. When the relay fails your F1 pump will continually run until it finally burns out and leaves you with a big bill. Replace it with the 50-amp version for a $100 to $200 and you’re set. Again, all but the late run 360’s suffer from motor mounts that wear and fail quickly. Ferrari introduced an improved version late in the 360’s production run that you can have swapped into your 360 for about $300 each. Expect to pay about $300 in labor to have them installed. 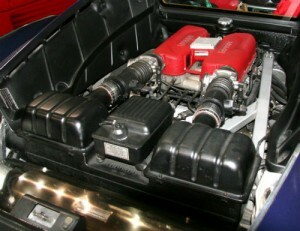 Short lifespans for transmission mounts plague all Ferrari 360’s. A simple upgrade to Ferrari 430 transmission mounts for a total cost of about $700 and call it a day. Every car has issues, the Ferrari 360 is no different. So let’s discuss some of the minor items. In the 2000+ cars pre-cats can sometimes fail. Though very rare, it can happen and cause a lot of destruction. Have them checked by a quality tech to ensure everything is good. Interior wear and tear is pretty well documented, scuffed kick panels and door sills, leather shrinkage on the dash, and plastic parts like buttons tend to get scuffed up and sticky easily. If your car’s VIN is below 124875, it left the factory with an old and poor version of the F1 software. Early model 360 Spider’s do not have an access compartment to the sub-frame attachment bolts. This can mean more in labor costs for several routine maintenance items. Electrical gremlins were common because of the all aluminum frame being problematic as a grounding source, not a big deal, and is an easy fix. Some of the early 360’s were known to have ball-joints that failed prematurely. Ferrari will only sell you complete A-arms, which is a rip-off, use the Hill Engineering upgraded replacements. Now on to the normal Ferrari 360 maintenance items. Annual fluid services can run from $600 to $1000. This is a pretty regular cost at both Ferrari dealers and independent shops. When having a major service performed we have seen the prices range from $2500 to $4000, but this can climb if more items and problems need to be addressed. Clutch replacements can cost $2500 to $5000 again depending on what needs to be done. Clutch life is usually pretty good and if you drive your 360 with some respect should see clutch life of well over 20,000 miles. We’ve seen many people report back with clutch life of 40-50,000 miles. Brake pad replacements and rotor resurfacing will run $600-900 and last but not least, oil changes. Oil changes typically cost between $199 and $300. Some Ferrari dealers have been known to run $99 oil change specials, needless to say, these book up fast. So there you have it folks. The Ferrari 360 has undoubtedly been a very reliable vehicle. Are their lemons out there, of course there are. But for the most part it has been a great driver’s car for many owners. If you are curious about other Ferrari models and their maintenance costs check out our articles on Ferrari F355 maintenance costs and other Ferrari vehicle maintenance costs.